A towering tornado ripped its way through the middle of Miami, Biscayne Bay and Miami Beach right after lunch on May 12, 1997, smashing cars and windows, tossing trees skyward and scaring the dickens out of thousands of people who were transfixed by the uncanny sight. 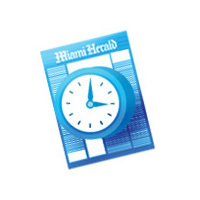 After forming in the Miami neighborhood of Shenandoah at around 1:55 p.m., the tornado pummeled East Little Havana, crossed the Miami River and Interstate 95, where stunned motorists stopped cold to let it pass. 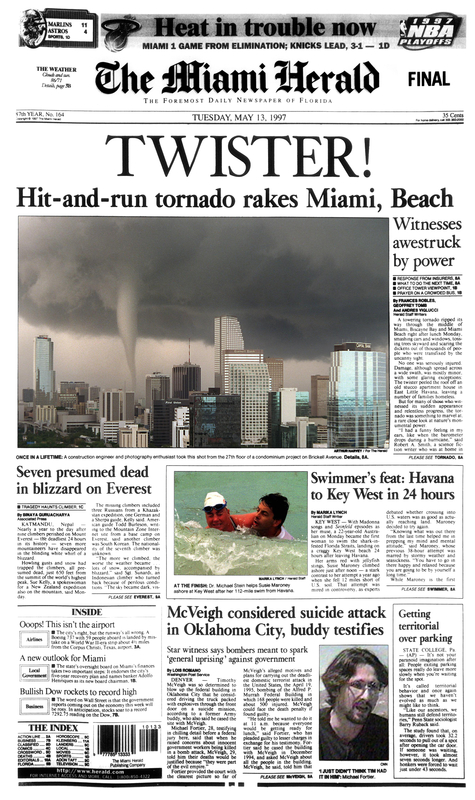 It then swirled through downtown, churned sea water into foam in Biscayne Bay, exploded transformers and uprooted trees on Biscayne Island, continued across the water to Arthur Godfrey Road in Miami Beach, where it blew out storefront windows and flipped over a car near Indian Creek. Then it dissipated into thin air. No one was seriously injured. 5/12/1997, Arthur Harvey/For The Herald: A tornado touched down in several places in Miami and Miami Beach today. 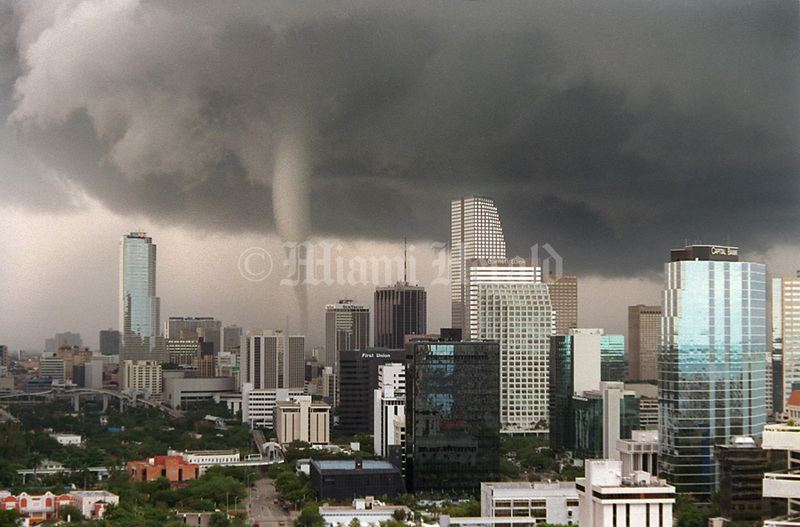 This photo was shot from 27th flor of the Santa Maria Condo on Brickell Ave, downtown. 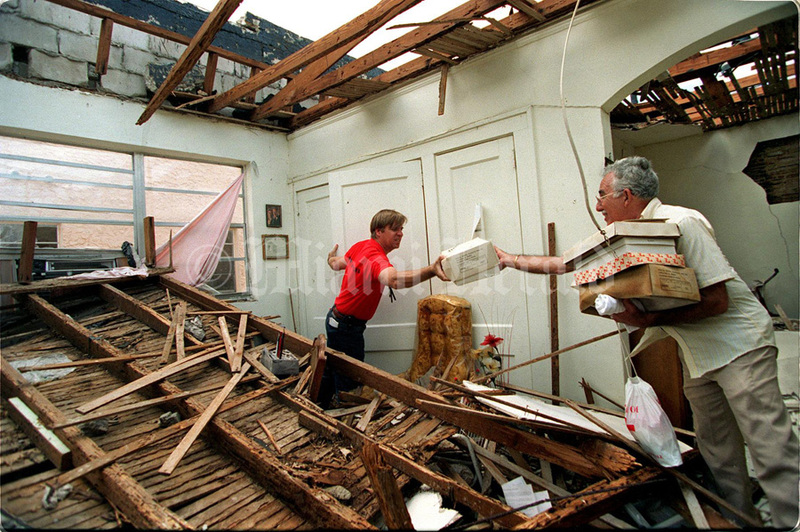 5/13/1997, AlDiaz/Miami Herald: Matthew Walton of the Red Cross Social Services Coordinator for Greater Miami and the Keys, helps Orlando C. Mora, 65, retrieve personal belongings. Yesterdays tornado destroyed apartment 32 and damaged the rest of the building at 871 SW 3rd street. 5/13/1997, Justin Best/Miami Herald: Workers from Lumiglass take out out the remains of broken glass caused by the tornado that ripped through downtown Miami on Monday afternoon at The Citadel. 5/12/1997, Al Diaz/Miami Herald: Armando Cosculluela sweeps up the tornado damage at 1171 SW 8th street Ultral/Joyeria. 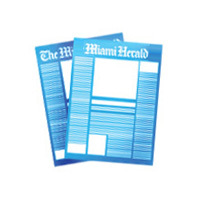 5/12/1997, Marice Cohn Band/Miami Herald: At the City of Miami Police Dept. 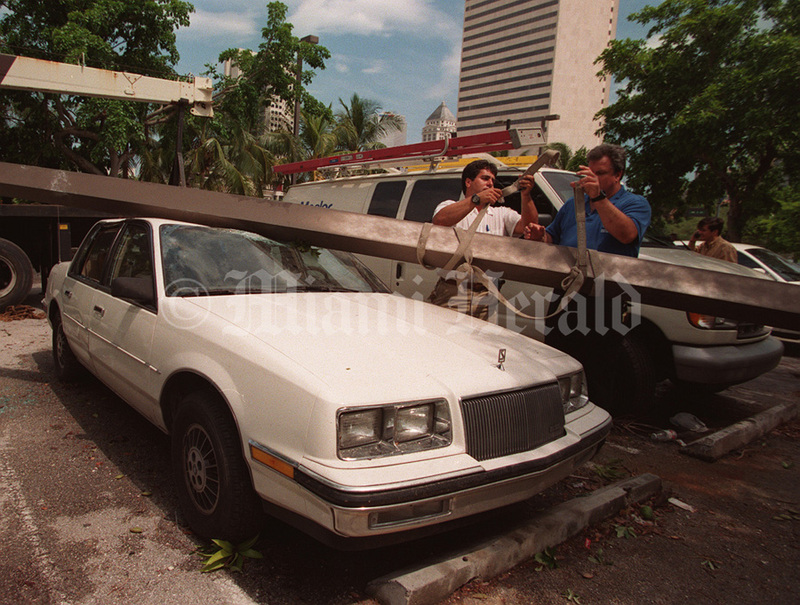 in downtown Miami, a lamp post is removed from a car, after a tornado touched down and tossed trees and debris about the downtown area. Oscar Valido (white shirt) an electrical supervisor at Dept. of Park and Recreation, and Henry Monteagudo, of City of Miami Police building services, help to remove the light pole from the car. 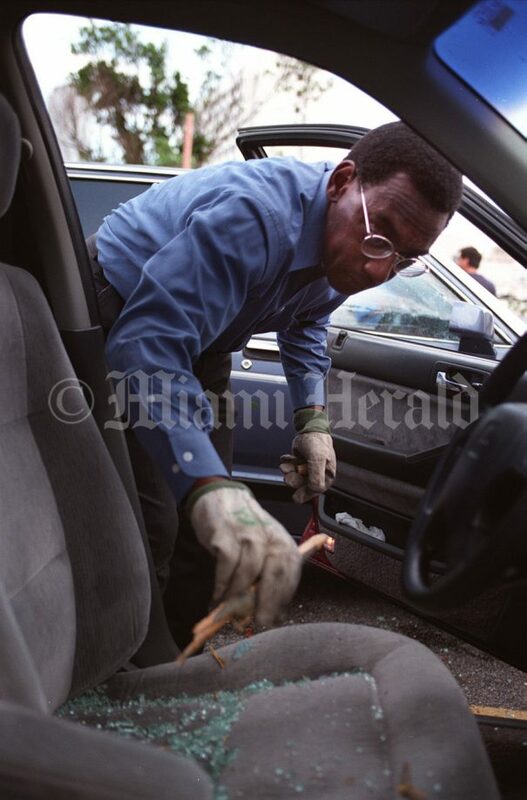 5/12/1997: Philip Sobers cleans glass and debris out his car in a parking lot at NE 6 Street and 2nd Ave. after the the a tornado passed through downtown Miami. 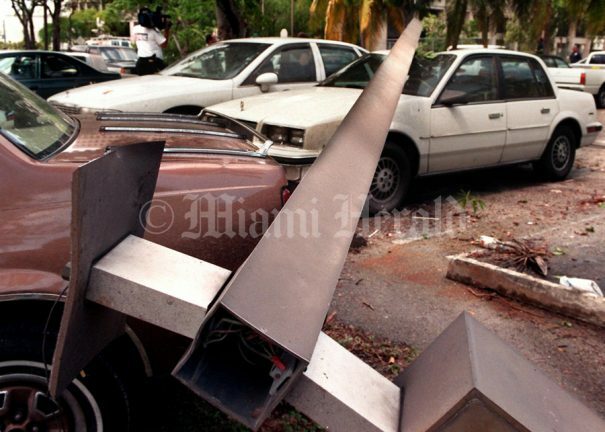 5/12/1997, Donna Natale/Miami Herald: One of the paths of the tornado was right through the City of Miami Police Department's parking lot..this light pole was torn right from its foundation and landed approximately twenty feet away on these cars. 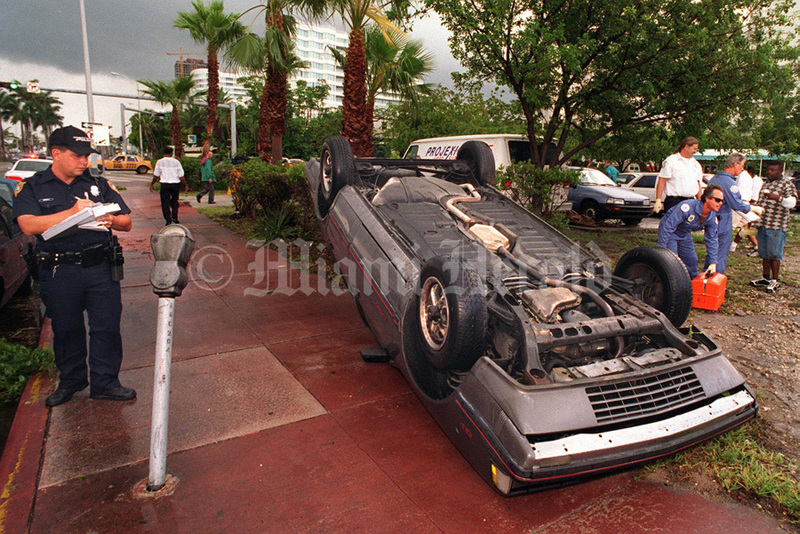 5/12/1997, Tim Chapman/Miami Herald: This parked car was flipped over by a tornado at 44 street and Indian Creek Drive on Miami Beach. No one was in the car according to Miami Beach Police. The wind blew the car right over the parking meter. 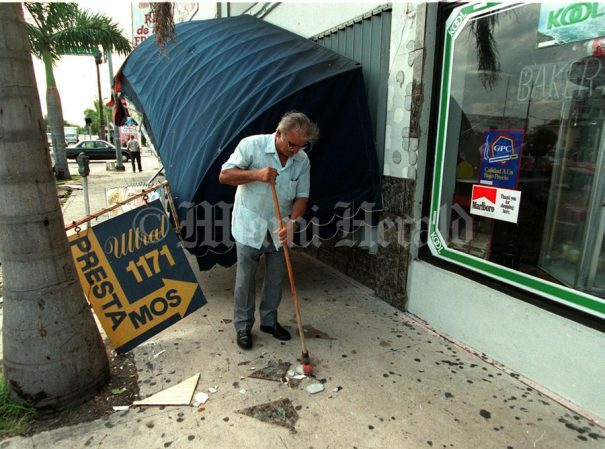 5/12/1997, Al Diaz/Miami Herald: Tornado damage. 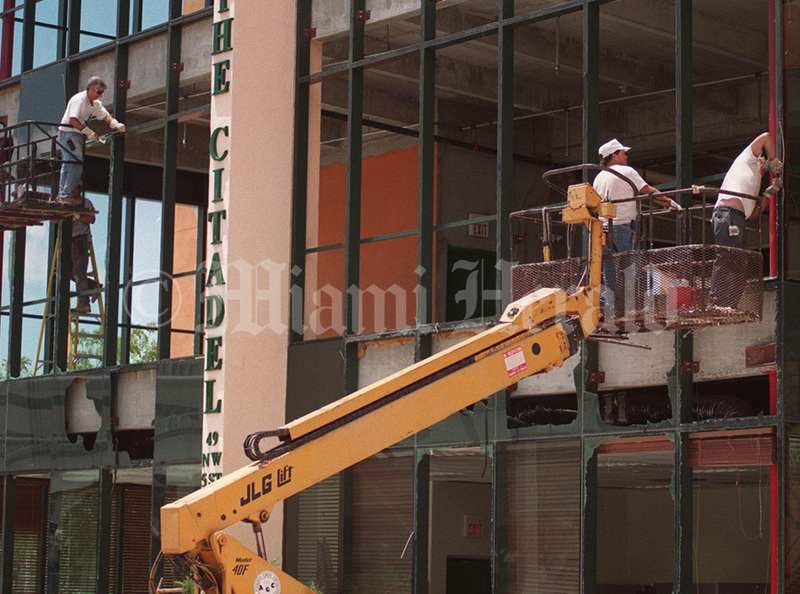 Orlando Rodriquez, 73, looks up at the hole in the roof of Yournet Fumero's, 19, apartment. 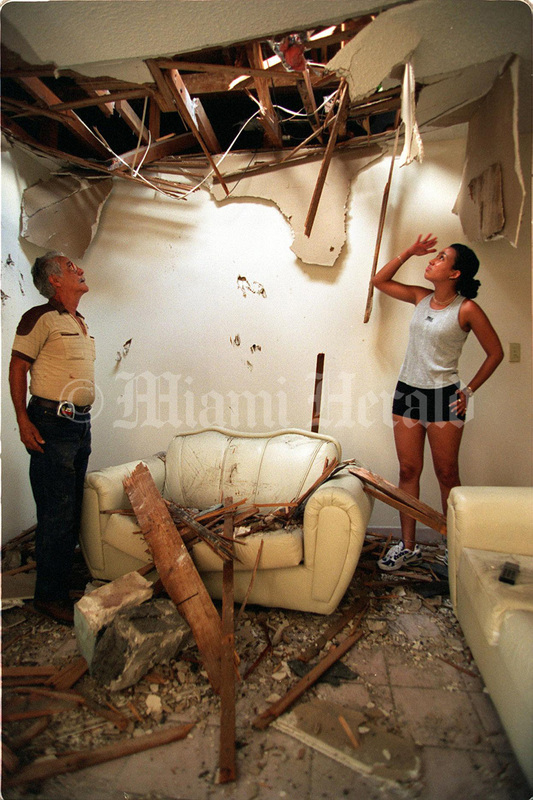 Fumero was sitting on the couch at right watching TV when concrete blocks came crashing through the roof. 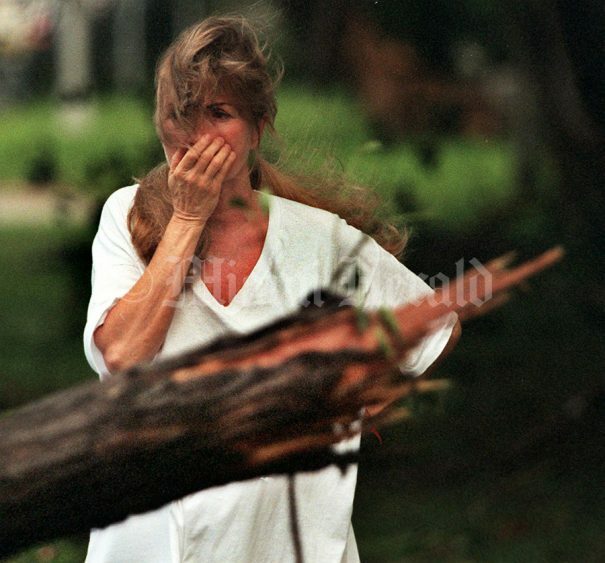 SW 4th and 9th ave.
5/12/1997, Bob Horton/For The Herald-- The Tornado hit Miami. 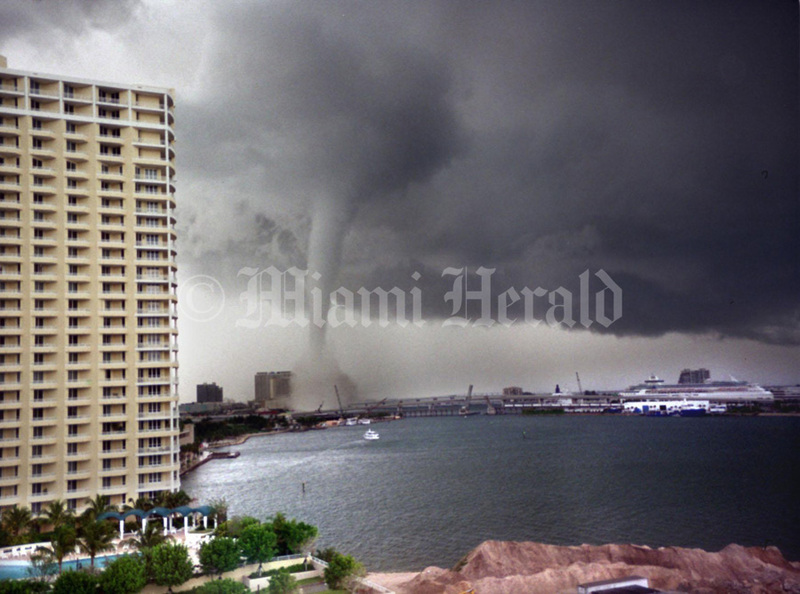 Photo taken from Brickell Key facing Bayside North. 5/12/1997 Al Diaz/Miami Herald: Patricia Martinez views damage along Venetian Causeway. 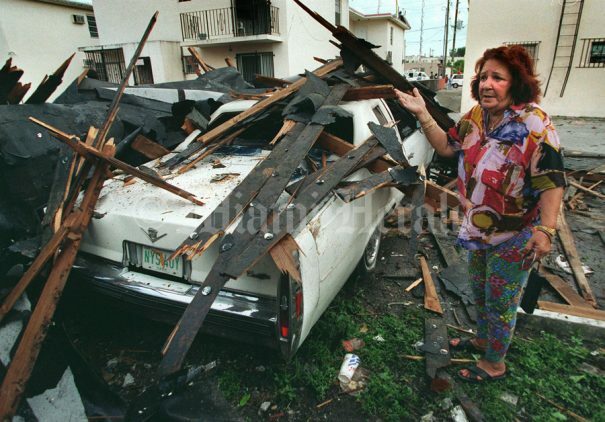 5/12/1997, Al Diaz/Miami Herald: Marta Lopez Hernandez inspects her car after a tornado ripped the roof off an apartment building next door.